This page includes selected articles from the 1997 issues of Across the Fence Post. 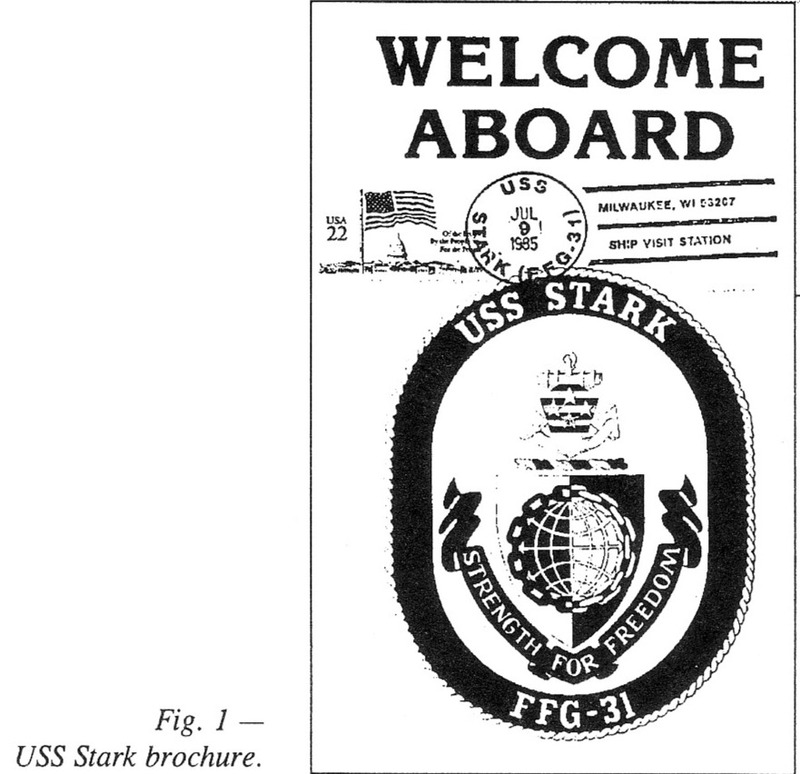 The USS Stark visited Milwaukee the weekend of July 9, 1985. 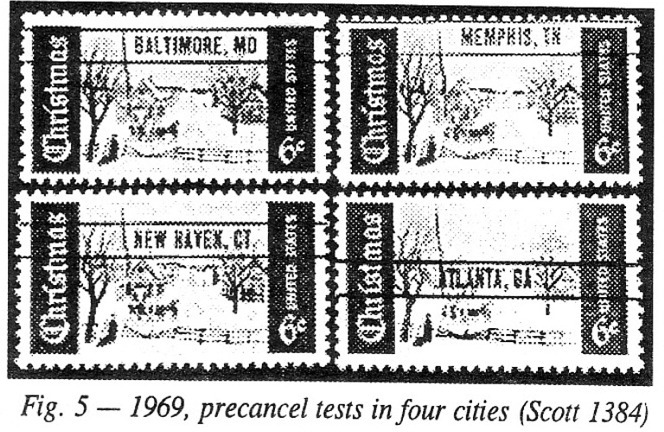 A cancel was offered and many area stamp collectors went to see the Stark and get the cancel. I'll always remember the high ladders and tiny hatches we faced as we toured the ship. Halfway up one ladder the thought crossed my mind that maybe I should get a new hobby. The cancels were available at the end of the tour. 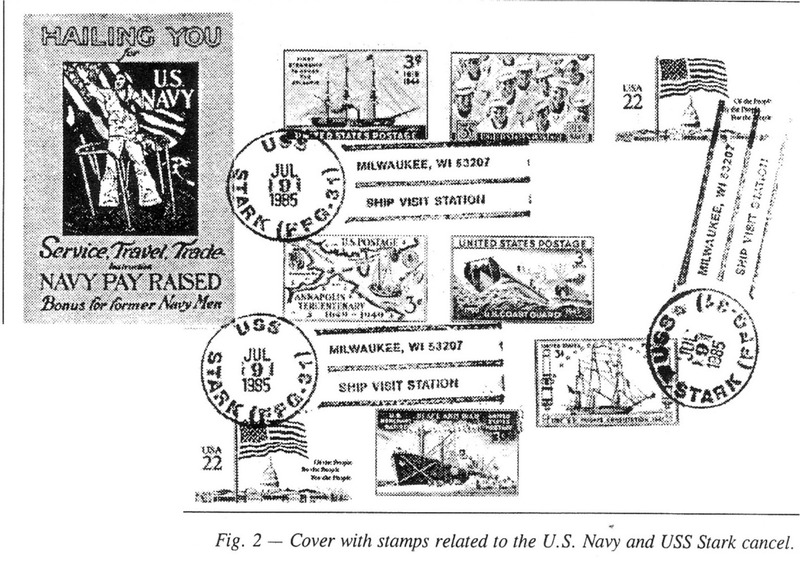 Visitors received an attractive brochure about the Stark and I had it canceled (Figure 1) along with a large-sized cover I had prepared with stamps pertaining to the U.S. Navy (Figure 2). Mary Ellen Daniel is also n member of the Polish American Stamp Club, Wauwatosa Philatelic Society, Czeslnw Slania Study Group, and American First Day Cover Society. Although her specialty is first-day covers, she has a variety of collecting interests. She extensively exhibits her FDCs and has had articles published in First Days, journal of the AFDCS. In 1994, Daniel was chosen as guest of honor at the Greater Milwaukee Area Distinguished Philatelists annual appreciation dinner. Jim Stearns is a part-time dealer, who along with his wife, Millie, operates as Jim and Millie Stearns, Stamps for Collectors. The business is operated out of their home and specializes in United States, Canada, Greece and Morocco. The Stearns’s also maintain a general inventory of worldwide stamps and picture postcards. Jim has been a lifelong collector and has been a dealer since 1973. He is one of the founding members of the Northwoods Philatelic Society (Iron Mountain) and is the club's current newsletter editor. Whenever I encounter new philatelic friends, the discussion invariably comes around to "What do you collect?" When I reply, "United States, Greece and Morocco," the response almost invariably is, "Why Morocco?" The answer is actually fairly simple. During my college years (1963-68), the Vietnam War caused many students to serve militarily or seek conscientious objector status. My good friend, Kenn, a chap from Flushina, NY, chose CO status and completed alternate service through a three-year hitch in the Peace Corps in Rabat, Morocco. Our friendship remained close and our correspondence was regular and frequent. 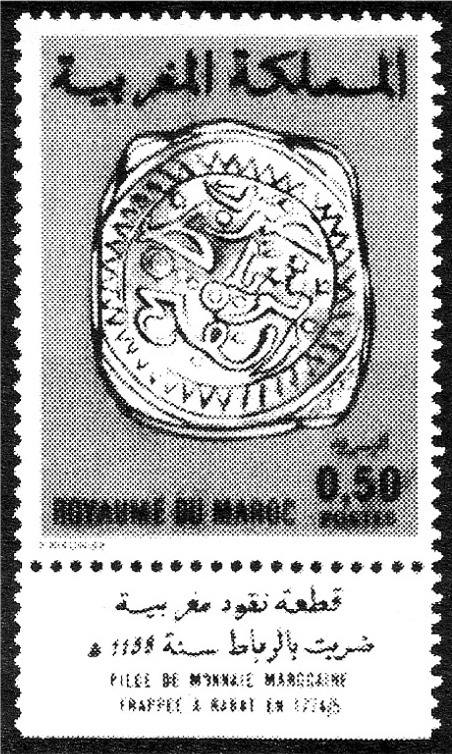 Kenn always franked his correspondence with the newest and most attractive Moroccan stamps. On his return to the states, Kenn presented me with a souvenir pack representing all of the stamps of Morocco issued during his three years in Rabat. Needless to say, this beginning led me down an interesting and intriguing road. 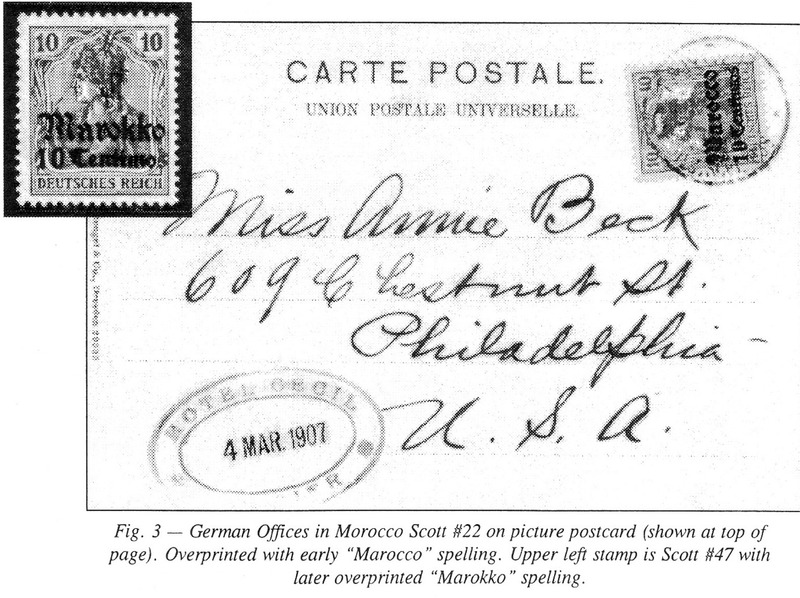 Moroccan philately encompasses a hodgepodge of material ranging from early pre-adhesive history, early European postal services to and from the kingdom, a variety of local posts, and multinational postal services including the presence of French, German, Spanish and British interests. There is also the Spanish and French protectorate era of Morocco, and finally Moroccan independence as a kingdom in 1956. Morocco occupies the southern half of the bottleneck guarding the entrance to the Mediterranean Sea, just below Spain, which occupies the northern shore. Situated on the northwest corner of Africa, strategic control over Mediterranean shipping provided intriguing possibilities for Morocco. Possessing no real international trade of her own, and having an attitude against involvement with any foreign interests, Morocco still succeeded in generating a terrific source of revenue from international commerce through piracy. 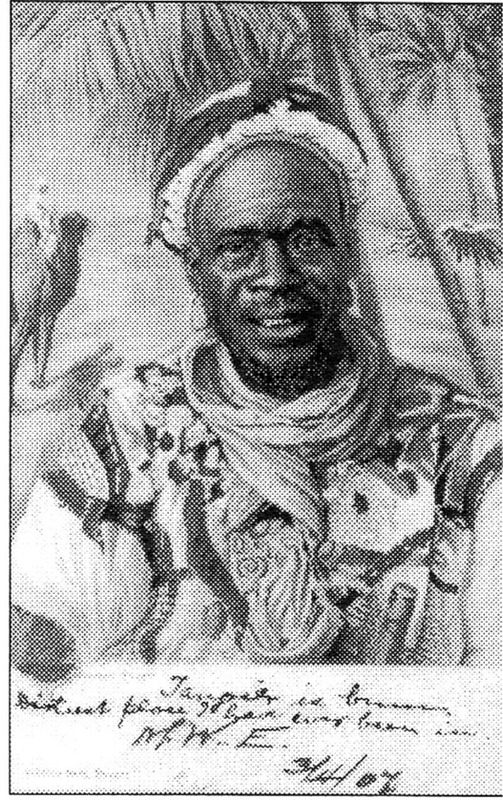 Moroccan pirates, called the Salee Rovers, were a major source of revenue from the 1600s to the 1800s. They, along with pirates from Tripoli, pillaged Mediterranean shipping, including that of the United States. In 1801, the fledgling United States decided to strike the first blow against piracy by declaring war on Tripoli. The Moroccan sultan, Moulay Souliman, sided with Tripoli, and in 1802 declared war on the United States. He communicated that war by sending an envoy to the United States, but reportedly thought better of it, and called it off even before we knew that war had been declared. In 1814, Morocco gave up capturing and enslaving Christians, and in 1817, outlawed piracy. With the elimination of piracy, commercial interests and trading between Morocco and European powers increased considerably. At first, Great Britain was the leading trading nation with Morocco. Spain and France were also involved, as was later Germany and Italy. In spite of the cessation of piracy and the increased access to Morocco, foreign influences in Morocco were kept to a minimum because of the attitude of her despotic sultan, Moulay Hassan, who resisted their presence. However, as pressures for economic development continued, one of the growing pains was the lack of a reliable communications system in Morocco. Communications was almost impossible, with no roads, no bridges over rivers and definitely no railways. Travel was restricted to dusty paths traversed by donkeys and camels. Waterways were crossed either by rafts or by simply wading. With increased trade, the inadequate communications system was less and less tolerable, and finally France was the first foreign country to open a postal agency in Tanger in 1854. Britain followed with a postal agency in Tanger in April 1857 (Figures 1-2), and Spain opened its offices in Tanger in the 1860s. 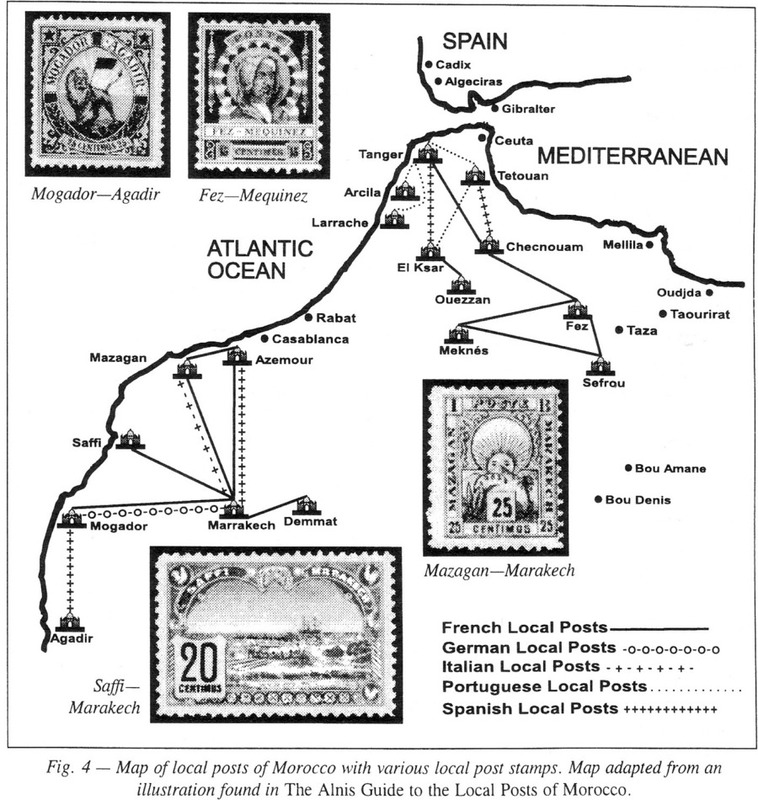 Additional British, French and Spanish postal services were established in port cities and coastal towns such as Casablanca, Mogador, Mazagan, Larrache and Rabat. Offices in Tetouan and Fez followed these. Germany made up for lost time by establishing postal services in most of the same places, and this sparked much competition between the economic powers (Figure 3). Before the foreign post offices were fully established, letters were given to captains of trading ships at the previous European port of call. Letters are known to have been carried from Hamburg, Lisbon, Marseilles, etc., often through Gibraltar to the Moroccan coast, using British, French, German, Spanish or even Egyptian vessels. In Morocco, the letters were handed over to the relevant post offices for distribution. Steamers usually carried mail from Morocco also, which sometimes led to rather interesting mixed frankings. In spite of the coastal installations, there were no postal services to inland towns until Britain opened a post office in Fez in 1892. In order to improve communications within the inland areas, private enterprise stepped in, and many private courier posts were set up. Their diversity and the short period they were in operation make them a particularly interesting area of philately (Figures 4-7). In 1892, Sultan Moulay el Hassen became alarmed with the increasing power of foreign interests insofar as economic loss was concerned. At that time, he authorized the establishment of a competitive postal service intended to plug this important drain of revenue. Cheritien Posts (sultan's postal service) operated from 1892 until 1913, and established initially eight routes. The workings of the service, owing to the negligence of government representatives, fell far short of the expectations of the sultan. It was scarcely used except for official mail. Private individuals and commercial houses preferred to use the private local or foreign services. 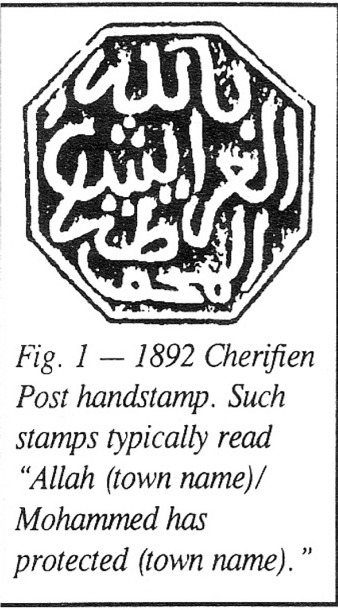 Cherifien Post mail first was franked by the cachets of the sultan, which were octagonal (sometimes round) hand stamps with entirely Arabic inscriptions representing each of the cities or towns served by the Cherifien Post (Figure 1). In 1912, the Cherifien Post began to produce adhesives (Figure 2). 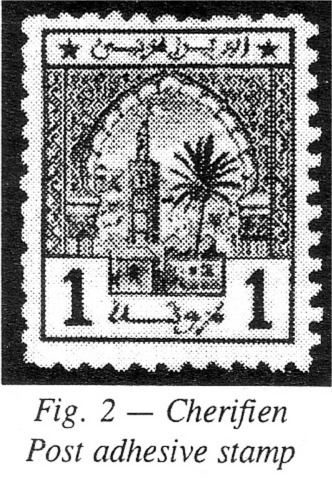 The Cherifien Post era ended in 1913, coinciding with the beginning of joint rule of Morocco by the French and Spanish, which was a result of the Treaty of Fez of 1912. The Treaty of Fez came about because of ever increasing threats of European interests and the inability of the sultan to control local chiefs. Faced with total loss of control without influence, or selecting the lesser of two evils, the sultan signed the Treaty of Fez, agreeing to Spanish and French rule. This also effectively headed off a threatening German interest in Morocco. The Spanish and French protectorate era spans from 1912 through 1955 (Figures 3-4). 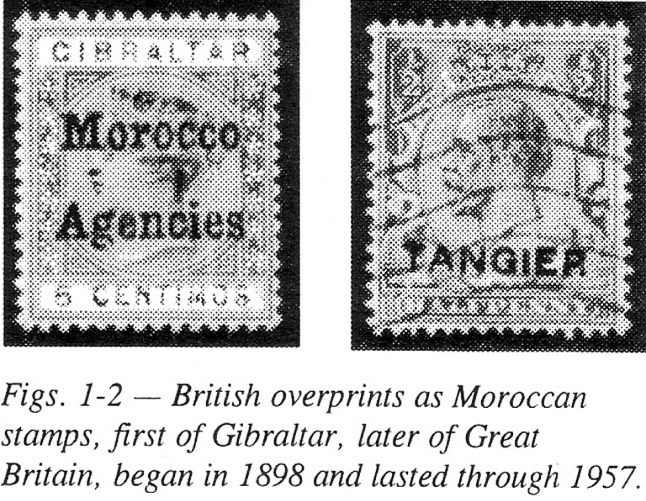 Great Britain continued to have a presence in Morocco and is well known for its stamps overprinted with British, French, Spanish, and Tanger zone designations (Figure 5). Finally, the World War II era resulted in increased nationalism in Morocco, favoring the ouster of the French and the Spanish. In 1955, France agreed to leave, and by November 1956, all land, with the exception of Infni, was returned to Morocco. The Kingdom of Morocco has existed from 1956 until the present time. 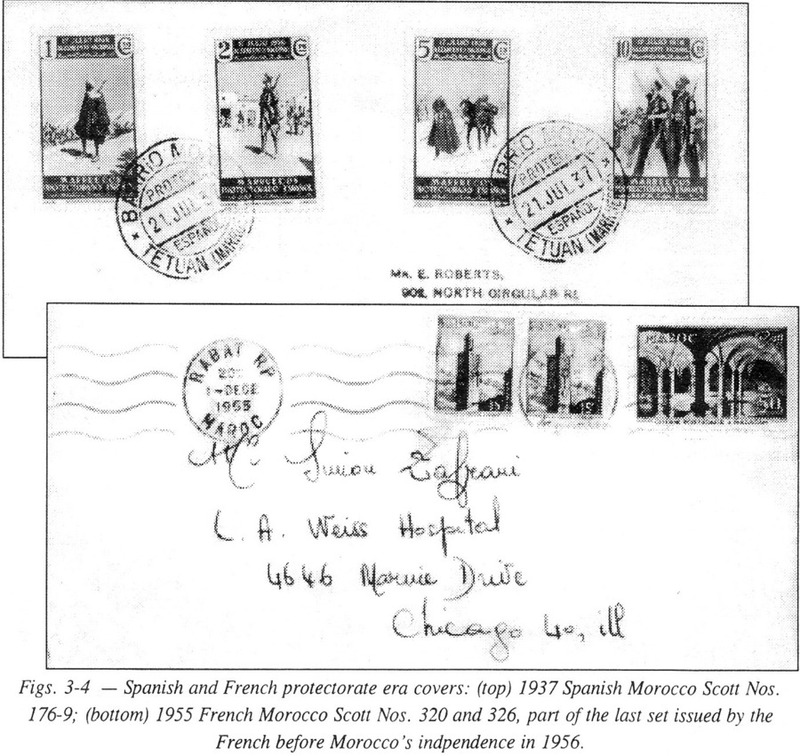 As mentioned in Part I, collecting Morocco begins with the understanding that there is much to the postal history of Morocco. Likewise, the catalogs and references available represent a blurred mosaic of information. A quick perusal of the Scott catalogs show 530 listings for Spanish Morocco, 336 for British Offices, 57 for German Offices, 540 for French Morocco and 900 listings for the independent Kingdom of Morocco. These, of course, do not include many cataloged varieties. The Alnis Guide to the Local Posts of Morocco reports on better than 556 issues, including the 22 issued under the authority of the sultan during the Cherifien Post era. Again, these numbers do not include varieties. Cataloging Morocco and its local posts also is greatly aided by acquiring Volumes 2 and 6 of the Yverte et Tellier catalogs. Beyond the complexity, one word of caution must be shared. It seems as though many of the foreign interests, upon the cessation of the validity of the local posts, failed to exercise much control over what happened to the remaining properties of the local posts. As a result, I former agents who had previous association with local posts continued to create "philatelic" emissions. Consequently, there is a fair amount of material that does not have legitimacy. Collecting Morocco confirms my "keyhole theory of knowledge," wherein looking at a keyhole from even two feet away reveals very little except a tiny opening. However, when one places an eye to the keyhole, an entire room or world opens up on the other side. I strongly recommend Morocco as an intriguing and complex, and yet collectible - foreign land. It is complicated enough to whet the appetite of even the most sophisticated postal historian, and it is, relatively speaking, under-collected. Morocco also fits with British, French, Spanish and German collections in general, and certainly it can stand alone as a very rewarding philatelic endeavor. Jim Hale, a member of the Wisconsin Philatelic Hall of Faire, has been collecting Wisconsin postal history for the past 45 years. He has exhibited his material and is a certified WFSC judge. Since 1970, he has served as editor of Badger Postal History, newsletter- of the Wisconsin Postal History Society. Jim has additionally edited and co-authored several WPHS bulletins. His book titled "Going for the Mail, A History of Door County Post Offices" was released in 1996. Jim lives in Madison, WI, and is also a member of the Badger Stamp Club. The first post office in what is now the state of Wisconsin was established at Green Bay on December 6, 1821. Before that date, mail had moved intermittently within our region for 150 years. Most letters traveled outside the postal system, since post offices were few and far between. Any trustworthy person traveling in the right direction carried correspondence, reports, business documents and other communications. A letter, for example, originating in Quebec and addressed to Green Bay would carry a notation such as "Per Indian," or "By favor of M. Grignon." Until about 1850, when envelopes and adhesive postage stamps came into use, all correspondence was in the form of folded letters. The address and postal markings were placed on the back of the sheet on which a letter was written, folded and sealed with wax. A great deal of postal history can be deciphered from the postal markings on such letters. 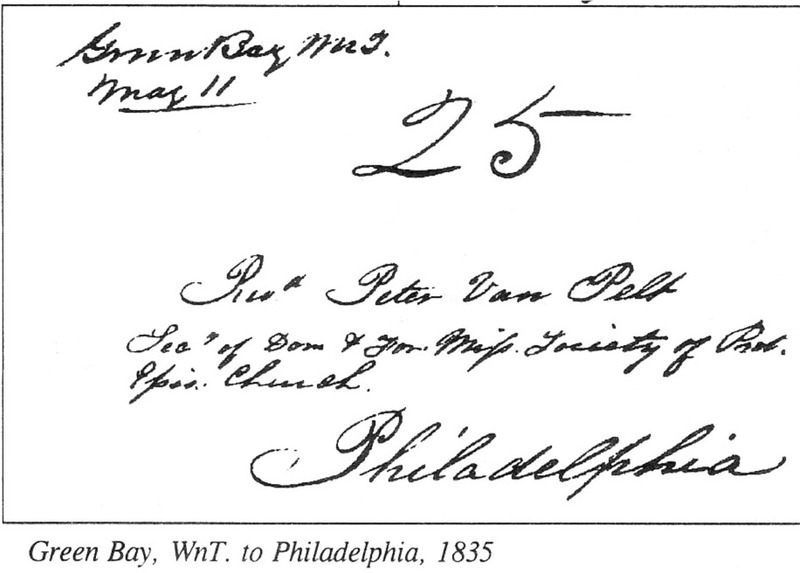 Postmasters were inconsistent in abbreviating their territory name in postmarking letters. MT, M.T., Mic.T., MTy and MicTy were used for Michigan territory; WT, W.T., WnT, WisT., WTy, Wter. and Wis.Ter. refer to Wisconsin territory; Wis. and Wise. may refer to either Wisconsin territory or the state of Wisconsin, depending on the date. 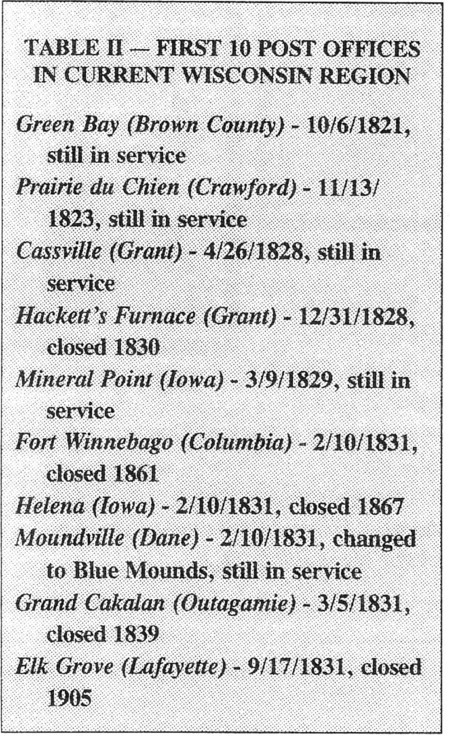 Many of the very early post offices of Wisconsin territory were located at sites that eventually came to be in the states of Iowa and Minnesota; so understanding the territory's chronology is important (Table I). When cut from Michigan territory in 1836, Wisconsin territory had an area of 280,600 square miles. 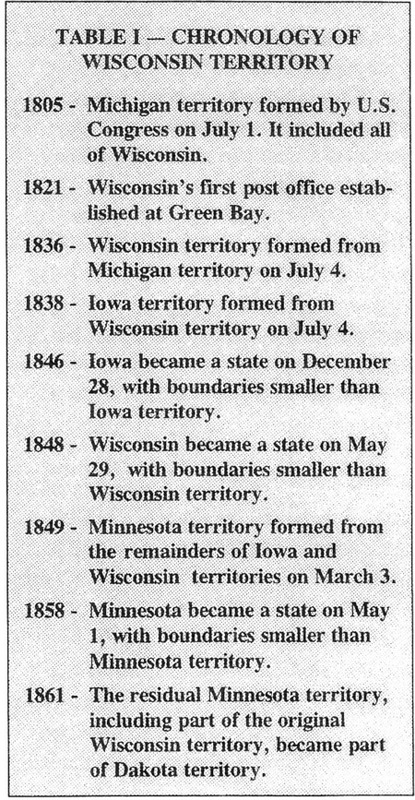 After Iowa territory was taken from Wisconsin, 86,000 square miles remained. Wisconsin again lost area and shrank to its present 56,000 square miles when it became a state. Many familiar names in Iowa and Minnesota had their post offices established while they were part of Wisconsin territory, such as Davenport, Dubuque and Fort Snelling. As emigrants moved into the "Wisconsin country" before statehood, postal service followed. Contractors were hired by the government to carry mail between the new offices. In 1832, for example, a weekly mail route was undertaken to Green Bay, by water when possible, but otherwise by foot, horseback or snowshoes. After four stops in Illinois, the northbound courier officially served settlements at Pike (Kenosha), Root River (Racine), Oak Creek (South Milwaukee), Milwaukee, (Port) Washington, Sheboygan, and Green Bay in Wisconsin. Letters might also be dropped off at Manitowoc Rapids or the Fox River for future delivery to some remote point when a traveler was going in that direction. 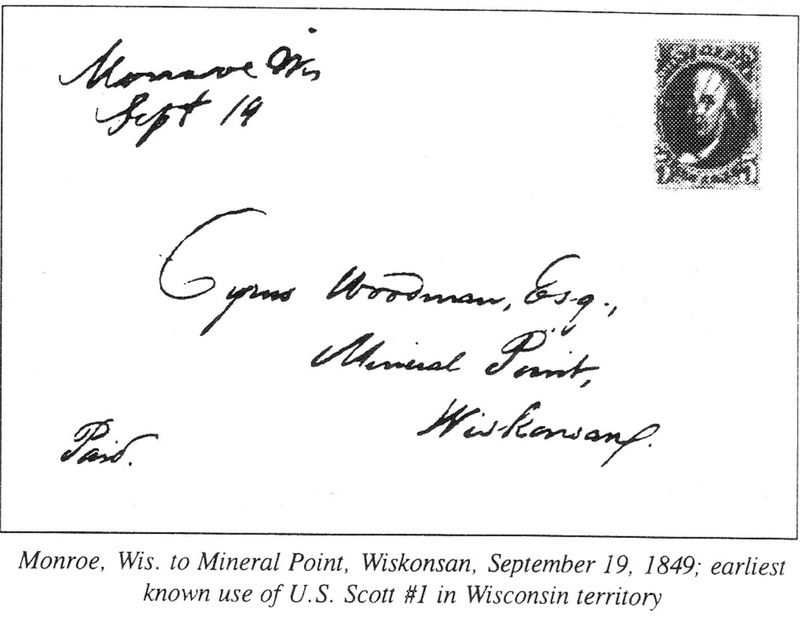 The first 10 post offices established in what is now the state of Wisconsin (Table II) were located to serve military posts, settlements in the southwest lead-mining region, and the Fox-Wisconsin river-travel route to Green Bay. Covers are known from at least 180 territorial post offices. Just a single surviving cover represents about 50. The typical territorial post office served a mere handful of people who had neither time to write nor money to pay postage. Many of them lacked the education to write. The annual receipts of many crossroads post offices totaled some such sums as $4.83 or $6.72, even though a single letter to or from the East cost 25c in postage. From 1825 to 1845, postage rates for a single-sheet letter ranged from 6c to 25c, depending on distance. After 1845, rates were 5c up to 300 miles and 10c over 300 miles. The appropriate rate was marked on each letter by the postmaster, as well as a town mark (usually in manuscript) and date. Many dates did not include the year, which makes it necessary to hope that the writer used the year in the letter's heading. 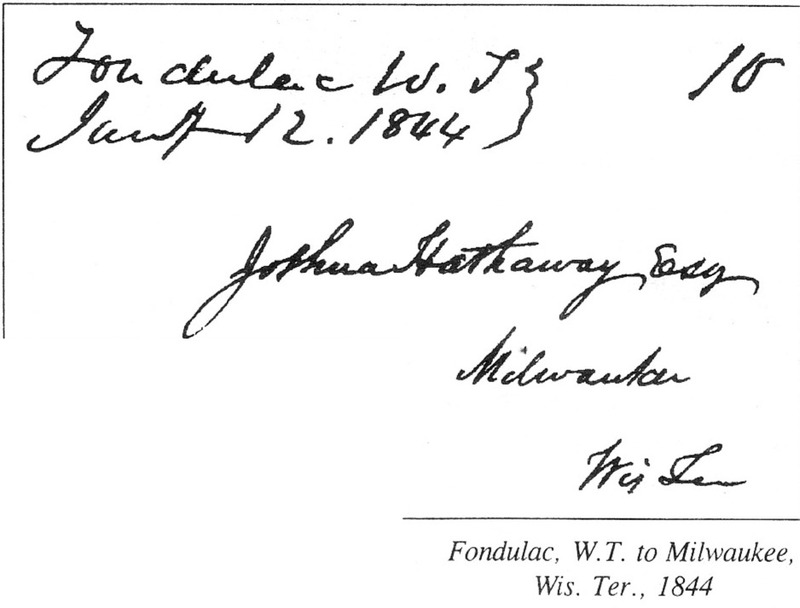 "Territorial and Early Statehood Covers Owned by the State Historical Society of Wisconsin" Bulletin# 22, Wisconsin Postal History Society, 1993 (available from WPHS, N95 W32259 County Line Rd., Hartland, WI 53029). Some illustrations are from photocopies of covers in the State Historical Society of Wisconsin archives. Robert Lieb collected stamps as a child and returned to the hobby in 1987. In 1992, he decided to specialize in thee Trans-Mississippi issue and has exhibited his collection at local and national shows in Michigan. His exhibit also appeared in open competition at W7SCOPEX '97. Bob's other collecting interests are United Stares airmail stamps and Israel. He is a member of the .4nrerican Philatelic Society and the Society of Israel Philatelists. Bobs position as senior public health advisor with the Centers for Disease Control and Prevention recently brought him to the Madison area, where he joined tire Badger Stamp Club. Next year marks 100 years since the printing of the Trans-Mississippi stamps, and rumors are they will be reproduced for the anniversary, just like what was done with the Columbians in 1993. Regardless of the outcome of the rumors, the anniversary is sure to bring collector awareness to the beauty of this series, the reason I began my specialized collection. This series is often called the "Omaha" issue because the event it commemorated was held in Omaha, NE. 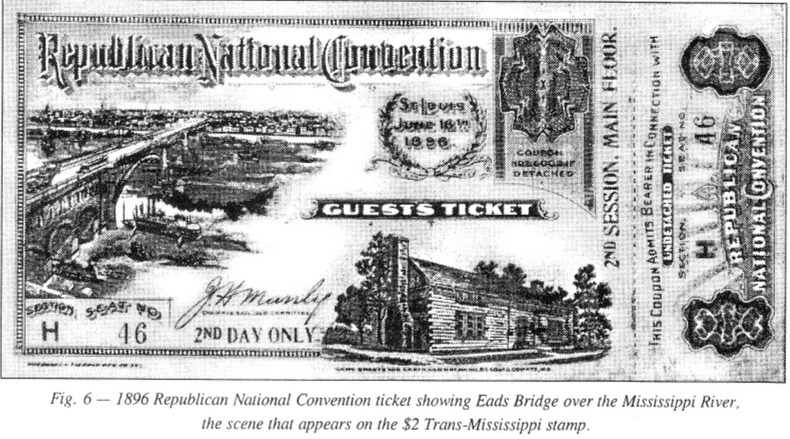 and was officially known as the Trans-Mississippi and International Exposition. The exposition was held from June 1. 1898, to November l. 1898, but the set of nine stamps was not placed on first-day sale until June 17, 1898. Today, this second set of commemorative stamps (the Columbians being the first) is widely regarded as one of the most beautiful sets ever issued. However, when the postmaster general announced his intention of including a $1 and $2 denomination within the series, there was a roar of protests from collectors, dealers, and stamp societies who felt imposed upon as when the long Columbian set was issued in 1893. The postmaster general's response was, "No one is compelled to buy the high values unless he wishes to do so." The Post Oft-ice Department originally planned to produce the stamps in two colors: the frames in various colors according to denominations, with all the center vignettes in black. 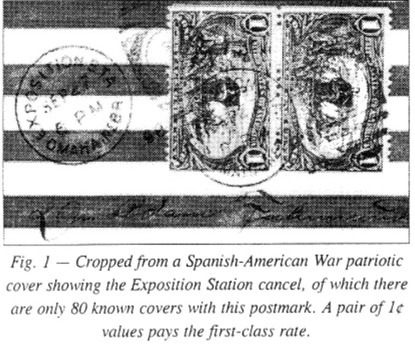 The bicolor idea was abandoned when the Spanish-American War broke out in April 1898 and necessitated the printing of enormous quantities of revenue stamps. Consequently, time and manpower needed to print postage stamps in two colors could not be spared. The Trans-Mississippi issue would not have been the first bicolor stamps since some of the 1869 pictorials are bicolored. 1c - The scene on this stamp was from a painting by Lamprecht titled Mrrrquerre on the Mississippi. Existing color varieties are dark-yellow green, yellow-green, and green. The 1c denomination paid the un-sealed circular rate, drop letter rate, and third-class letter rate. Figure 1 shows proper usage of a pair of the 1c values for the 1898 first-class letter rate. 2c - This stamp depicts a Western graintield from the photograph Fanning in the West. Color varieties are copper-red, brown-red, and light-brown red. 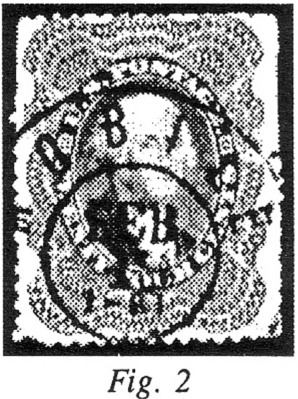 It was the most commonly used stamp from the series as it paid the 1898 first-class letter rate. Bicolor proofs show the scene on the 2c stamp was originally intended to be used on the $2 stamp and vice versa. It was suggested that because the 2e denomination would have a much wider circulation, it should bear the scene that is most representative of the West. Thus, the scenes were switched when the stamps were issued. 5c - The wood engraving Fremont on Rocky Mountains was modified for reproduction on this stamp. Color variations are blue, dark blue, dull blue, and light blue. It paid the first-class overseas rate. Figure 2 shows an example of its proper usage. Although the Trans-Mississippi issue had few production errors, one error (and a rarity) is an 8c vertical pair imperforate horizontally that is listed in the Scott catalog for $17,500! Robert A. Siegel Auction Galleries, Inc offered the pair for sale in 1995. 10c - Hardships of Emigration, a painting by A. G. Heaton, is shown on this value, which paid the special delivery rate. 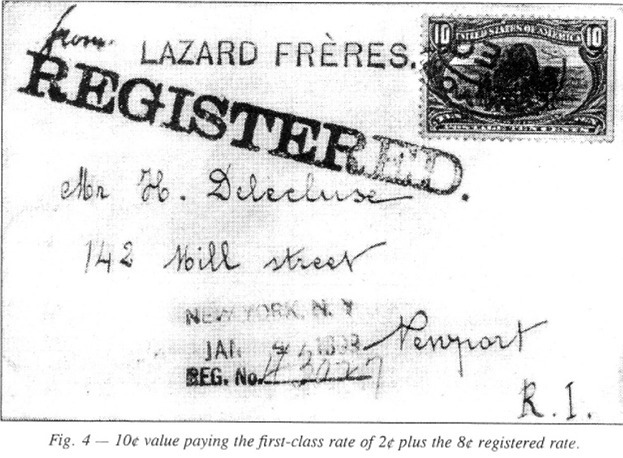 Figure 4 shows this value used for franking a registered first-class letter. There is two color varieties for this stamp: gray-violet and blackish violet. 50c - Another Frederic Remington drawing was reproduced on this stamp, It is titled Western Mining Prospector and can be found in sage green and dark-sage green. It did not pay any particular postage rate. $1 - This Trans Mississippi is widely regarded as the best design ever for a United States stamp. 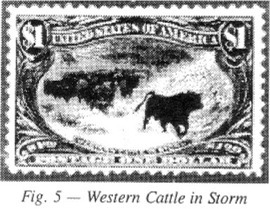 It shows a reproduction of a picture by J. MacWhirter titled Western Cattle in Storm printed in black (Figure 5). Mike Lybarger has collected the world since he was in eighth grade (with time out to get interested in girls, get married, get a Ph.D. and raise a family). He currently teaches history and political science at Edgewood College in Madison, WI. Mike regularly assists with the Badger Stamp Club youth program and is a member of the American Philatelic Society. At about 11 a.m. CST on July 1, 1997, an era ended. C-Span viewers saw the Union Jack lowered to the strains of "God Save the Queen" and the flag of Communist China raised to the accompaniment of the "March of the Volunteers." With this ceremony, the Crown Colony of Hong Kong and its surrounding territories became the Hong Kong Special Administrative Region of the People's Republic of China. 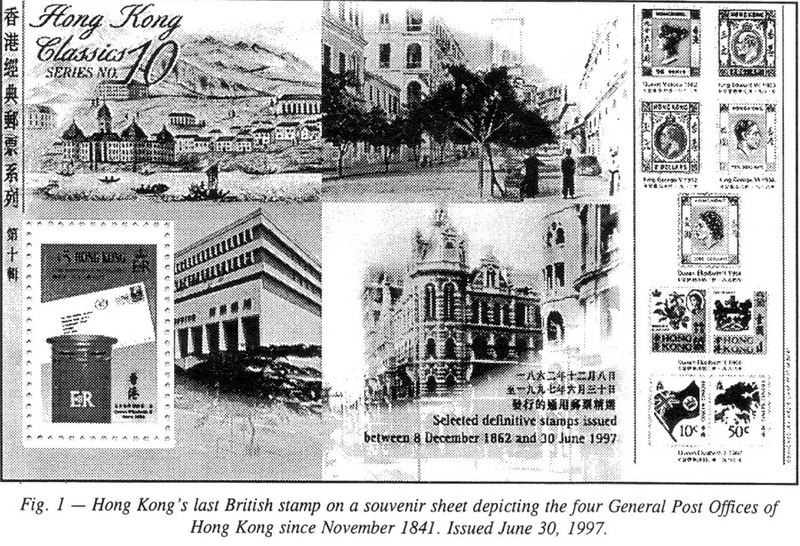 Earlier, on June 30, Hong Kong's last British stamp was issued within a souvenir sheet. The sheet depicts the four post offices of Hong Kong that were in operation during the 150 years of British rule. It also includes reproductions of six stamps, each depicting one of the English sovereigns during British rule (Figure 1). 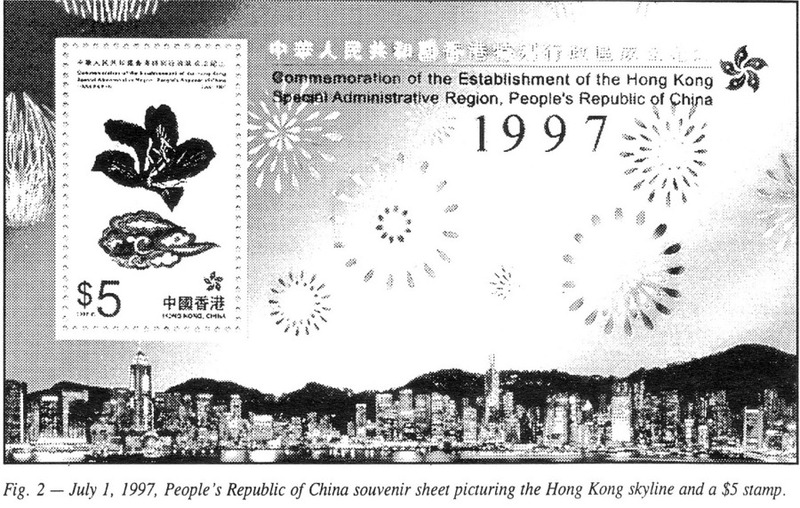 On July 1, the People's Republic of China issued a souvenir sheet picturing the Hong Kong skyline and a $5 stamp featuring a floral symbol of the city (the Bauhinia blakeana, a species of orchid) (Figure 2). Behind the handover ceremony and the two stamp issues lay more than 150 years of history. During the 19th century, the Chinese Empire was moribund. The industrial European states - Britain, Russia, Germany, France, and Italy - all sought trade and political advantages at the expense of the declining empire. However, these advantages existed mainly in the imagination of European and American merchants. China needed very little of what the West had to sell and wanted still less. Events came to a head in the 1830s. The British East India Co., a semipublic trading company under the control of the Crown and Parliament, was in financial difficulties. Although the Chinese had declared opium illegal in 1799, the Company continued to sell the drug to the Chinese. By the late 1830s, opium sales to the Chinese were the most lucrative part of the Company's business. In 1839, Chinese officials boarded British ships, confiscated the opium, and burned it. The Royal Navy retaliated, and in 1841 Great Britain declared war on the Chinese Empire. The Opium Wars were over in 1842. Their outcome was the inevitable result of the great technological difference between advanced industrial states and more traditional societies. The Treaty of Nanking marked the formal end of the wars in 1842. Hong Kong (called "the fragrant harbor" by the Chinese) was ceded to Great Britain in perpetuity, and the cities of Canton, Amoy, Foochow, Ningpo, and Shanghai were opened to British trade. On learning of the treaty, Lord Palmerston, the British foreign secretary, referred to Hong Kong as a "worthless rock." 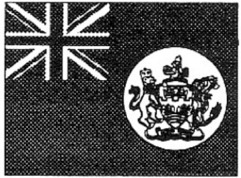 After additional conflicts with China in 1860, Great Britain gained Kowloon and Stonecutters Island. In 1898, the Germans occupied Kiaochow. This set off a scramble for concessions from China by Britain, Russia, France, Germany, and Japan. As a result, Britain secured a 99-year lease on Kowloon and Wei-hai-wei on the mainland opposite Hong Kong. 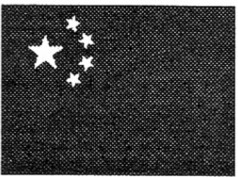 Figure 3 illustrates the first handstamp and adhesive issue used in Hong Kong. 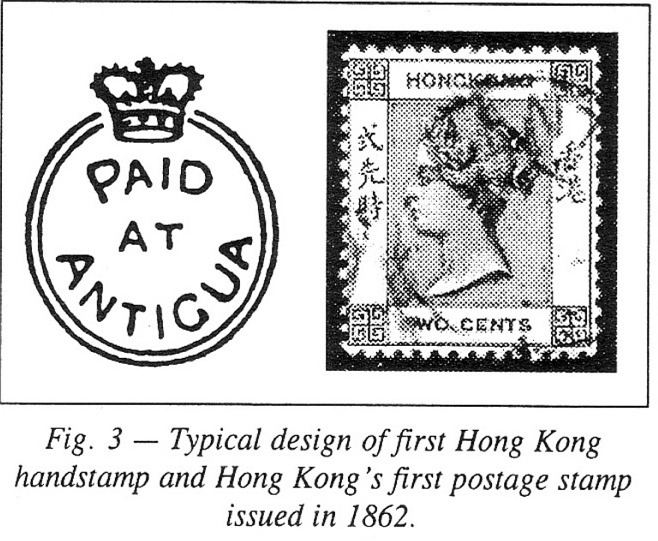 I have been unable to locate an actual Hong Kong cancellation, but according to the Stanley Gibbons Stamp Catalogue, Hong Kong's first was identical in design to the one used in Antigua. The handstamp was used on British stamps, and if you can find one today, count yourself lucky or rich. Gibbons catalog value is £550. The first postage stamp was issued in 1862. Hong Kong grew slowly until after the establishment of the Chinese Republic in 1912, when it became a haven for political refugees - a role it would play several times more in this century. With the out-break of the war between Japan and China in 1937, 750,000 Chinese sought refuge in Hong Kong, and by 1941 the British governor general estimated that 500,000 people were sleeping in the streets. On Christmas Day, 1941, the British troops in Hong Kong surrendered to the Japanese and many Chinese civilians fled the city. After the Japanese surrender in 1945, Chinese civilians returned to Hong Kong at the rate of 100,000 a month. The population increased during 1948-49 as the Chinese Nationalist Government began to face defeat by the Communists in the civil war. By the spring of 1950, there were 2.2 million people in the city. During the 1950s, Hong Kong's economy suffered as a consequence of the United Nations' embargo on trade with the People's Republic of China. The territory, however, developed internal industries. Textiles, electronics, watches, as well as other low-priced goods began to flood into world markets. Hong Kong's success was due to a large, continually growing labor force, inventive and resourceful people (many of whom were refugees from the Communists), and favorable tax policies. Starting with the cultural revolution in the People's Republic in 1967, refugees again flooded into Hong Kong. By the mid-1970s, the political situation moderated and little by little Hong Kong and the People's Republic began to work together on joint projects. Junkets by other presidents followed Richard Nixon’s trip to China in 1972 and members of Congress. American, European, and Asian businessmen sensing that China represented the last great untapped market, flocked to Hong Kong. The city was again transformed. Many of the manufacturing industries moved to the People's Republic, and Hong Kong became a center for financial services. In 1982, Prime Minister Margaret Thatcher, knowing that the 99-year lease on the New Territories was due to expire in 15 years, opened talks with the government of the People's Republic. Since the Chinese maintained that all three treaties, which brought Hong Kong into existence, were signed under pressure and thus unjust, the talks were soon expanded to include all of Hong Kong. These talks resulted in a Joint Declaration in 1984, whereby Britain and the People's Republic agreed that sovereignty over Hong Kong would revert to the People's Republic of China in 1997. The Joint Declaration also provided that for 50 years after 1997, Hong Kong's capitalist lifestyle would remain unchanged. The territory is supposed to enjoy a high degree of internal autonomy, except in foreign and defense affairs. China's socialist system and policies will not be put into effect in Hong Kong. 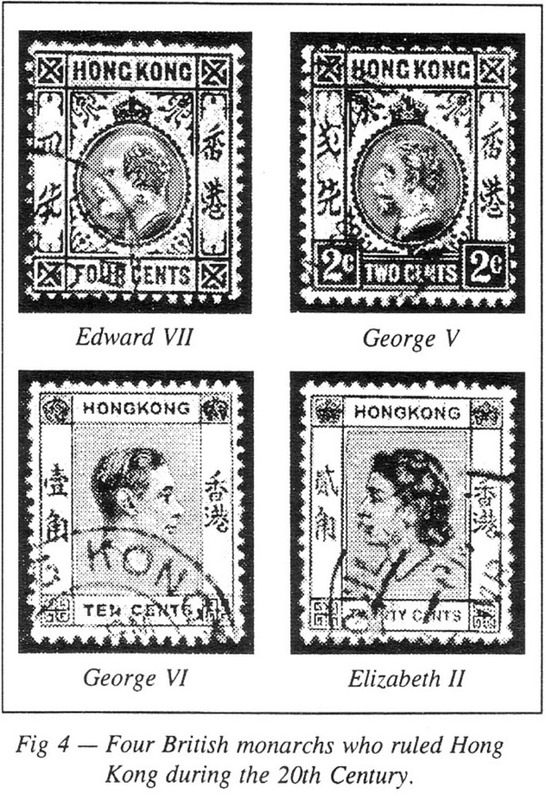 The stamps in Figure 4 depict the four British monarchs who ruled Hong Kong during the 20th century. They include Edward VII, George V, George VI, and Elizabeth II. Edward VIII abdicated before a stamp depicting him could be issued. I suspect that for many people in the West as well as in Hong Kong, the handover was somewhat abstract. But on June 3-4, 1989, the abstract became frightfully concrete. Elements of the People's Liberation Army butchered 800 or more pro-democracy students on Tiananmen Square in Beijing. Perhaps as a result of this event, Britain sent Chris Patten to Hong Kong as its last governor general. Perhaps again as a result of the June 1989 event, Patten determined to try to establish democratic institutions in Hong Kong before the handover. A legislature and a type of city council were elected. A fundamental law guaranteeing civil and political rights was established. One consequence of these efforts was that the government of the People's Republic of China began to refer to Patten as a "running dog of imperialism" and other equally complimentary epithets. As the handover approached, the Chinese government replaced the entire elected legislature. Prior to this action, Beijing indicated that Hong Kong citizen Tung Chee-hwa would be the city's chief executive upon the handover. Patten has recently criticized the government for failing to institute adequate safeguards for Hong Kong's fledgling democracy. Gary Zink has collected stamps since 1962, and began his specialty collection of Confederate stamps and covers in 1973. 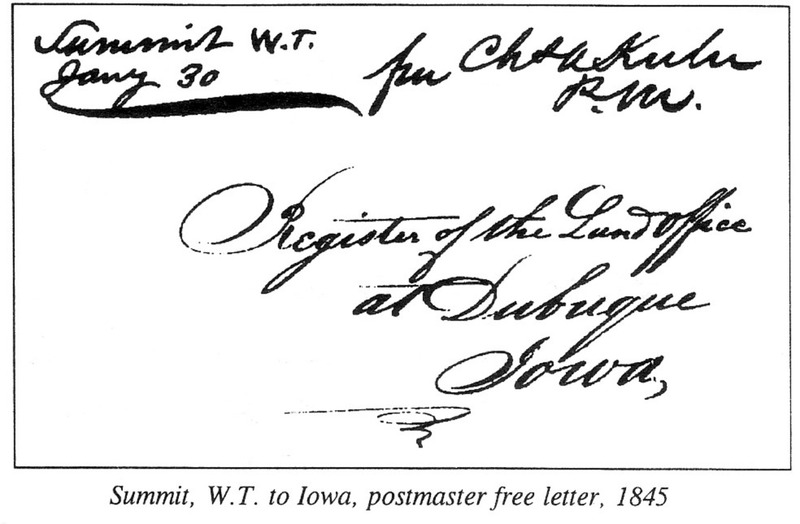 In addition to his local membership in the Janesville Stamp Club, he belongs to the American Philatelic Society, Confederate Stamp Alliance, and Universal Autograph Society. He's also a member of the History Round Table, a group that meets in Madison, WI. Gary has widely exhibited his collections since 1980 and has won many awards, including four Best of Shows. His exhibit titled "A Brief Study of the Confederate London and Local Printings" took a bronze medal in open competition at STAMPSHOW 97. At this time, the states were still using United States stamps. They were valid for usage until June 1, 1861, when the Confederate Post Office took over. On that date, United States stamps were declared invalid and Southern postmasters were told to use whatever means they had to provide postage to the general public. Government postage (regular issues) would not be available for usage until October 16, 1861. The seceded states formed their government and the Confederate States of America was established on February 4, 1861. The cover in Figure 1 was canceled on February 4, 1861, in Raleigh, NC. North Carolina was admitted to the Confederacy on May 27. U.S. Scott #26 was used for postage. 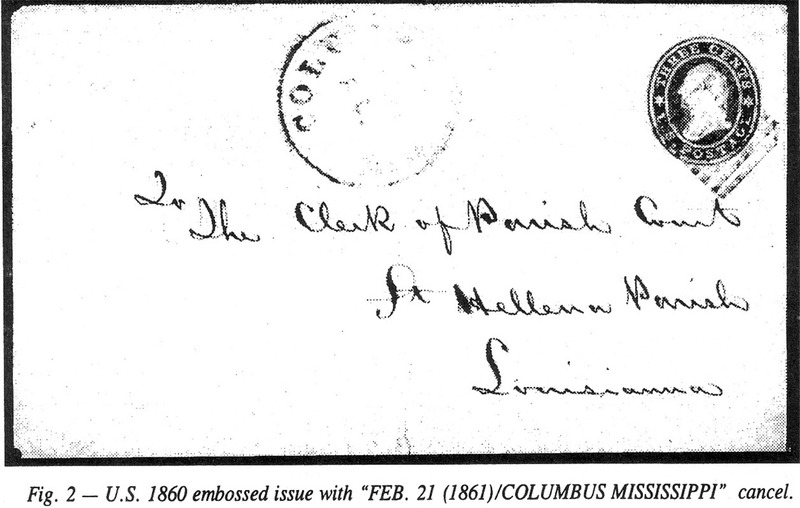 Figure 2 shows the embossed 1860 issue canceled February 21, 1861, Columbus, MS. This particular issue of embossed covers is the only one that was postally used in the Confederacy. The cover in Figure 3 includes a U.S. Scott #26. It was canceled February 21, 1861, in Mobile, AL. Alabama joined the Confederate States of America just 17 days before. 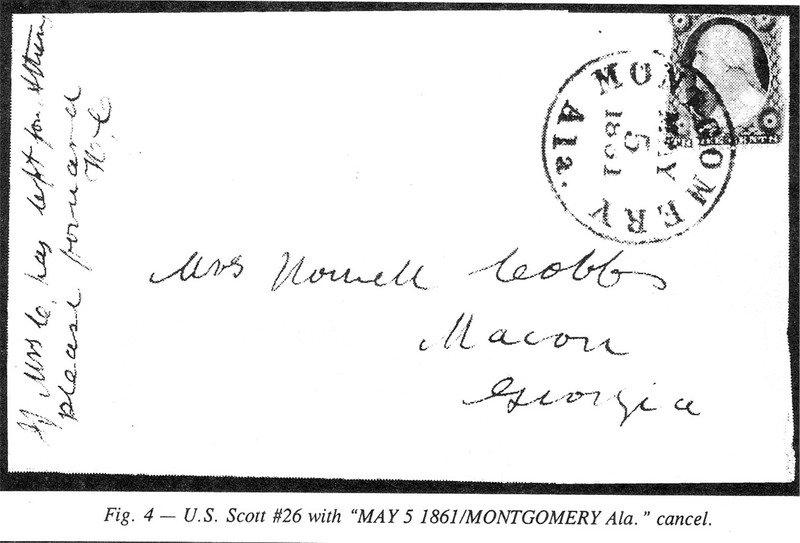 The cover in Figure 4 was also franked with a U.S. Scott #26 and canceled May 5, 1861, in Montgomery, AL. At that time, Montgomery was the capital of the Confederate States of America. The seat of government was moved to Richmond, VA, a little more than 20 days later. It was felt Richmond could be more strategically defended than Montgomery, AL. The United States 3¢ embossed star-die envelope shown in Figure 1 was issued in the fall of 1860. Postmasters in the Southern states were still issuing this type of envelope when they began to secede. 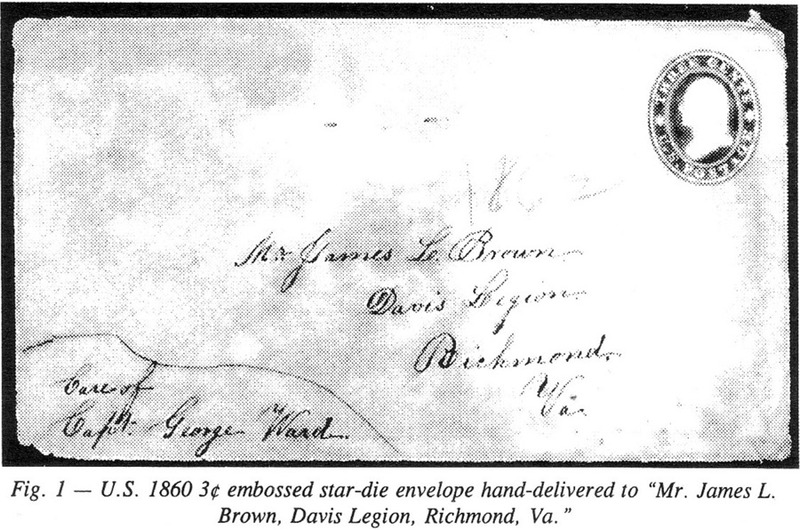 The cover was hand-delivered to Mr. James L. Brown, of Davis Legion, Richmond, VA, care of Capt. George Ward. The Davis Legion was formed in the fall of 1861 and named in honor of the president of the Confederate States of America, Jefferson Davis. Letters to foreign countries from the Confederacy franked with higher United States stamp denominations are scarce to very rare. Less than 10 of the 24¢ 1860 issue have been recorded. 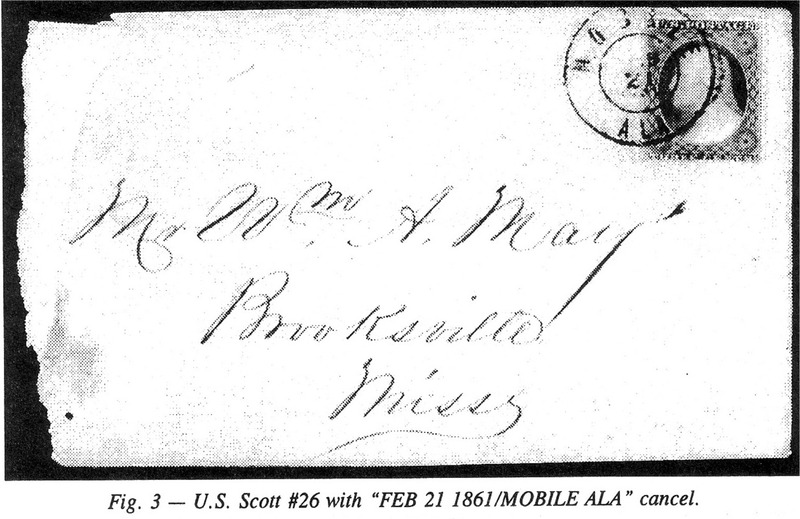 The United States 1860 24¢ gray-lilac (Figure 2) with a double-circle date stamp of Mobile, AL, was canceled February 19, 1861, 15 days after Alabama joined the Confederacy. Alabama was an original member of the Confederacy. The first-class letter rate to England was 24¢ and it is speculated that this stamp was used on a letter posted from the Confederate Post Office of Mobile and carried by ship overseas prior to the Union blockade in April 1861. The Confederacy produced official and imprinted envelopes for government use only. 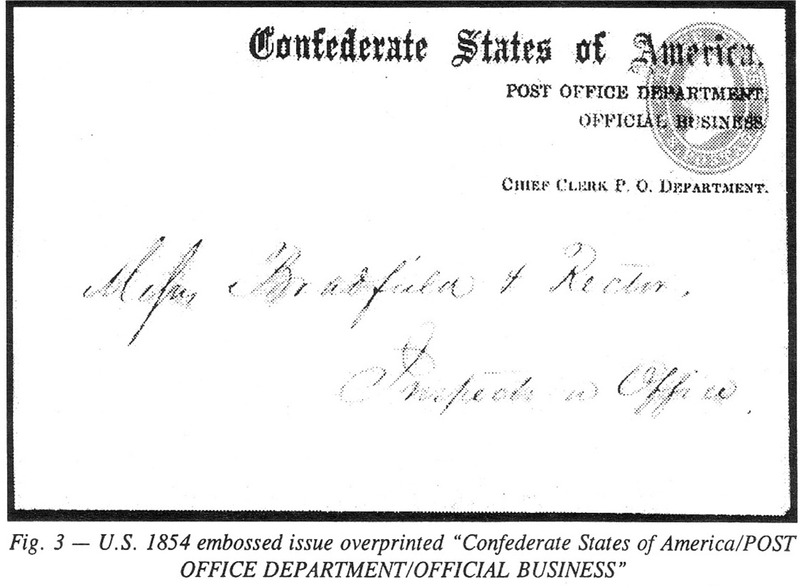 The cover in Figure 3 is a United States 1854 3¢ embossed buff envelope over-printed Confederate States of America/Post Office Department/Official Business. It was hand-delivered to the Inspection Office just down the hall from the chief clerk of the Post Office Department. The Civil War created emotions of the greatest intensity in both the South and the North. 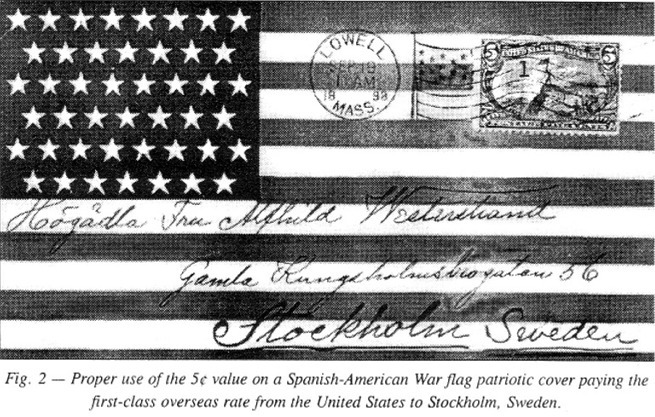 The production of envelopes decorated with flags, portraits, slogans, cartoons, battle scenes and many other items provided a means of expression for patriotism or hatred. Before the Civil War began, many such envelopes appeared in the North depicting presidential candidates and anti-slavery themes. 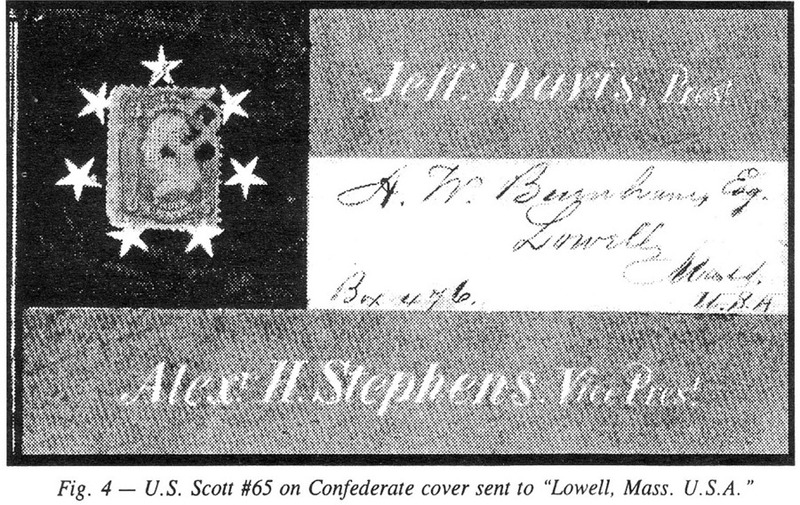 The early Confederate covers of this type were printed in the North, and an example is shown in Figure 4. 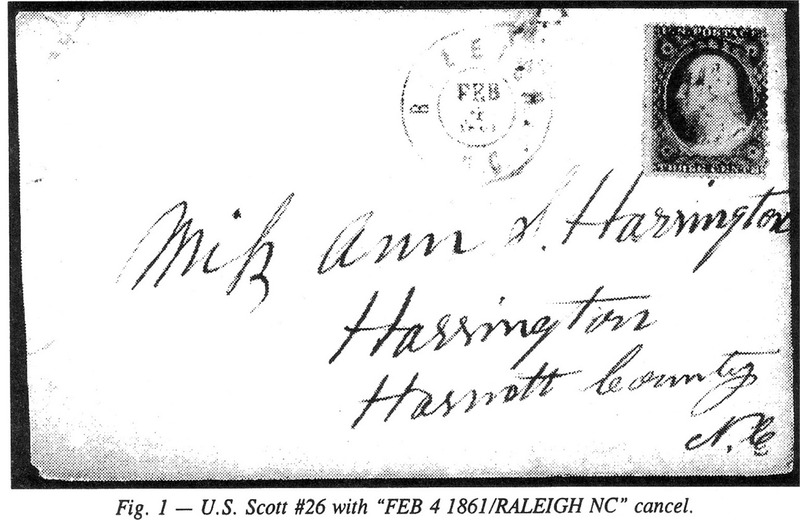 It includes a U.S. Scott #65 and was sent to Lowell, MA. At the time, only seven states had joined the Confederacy. As mentioned previously, United States stamps were valid for postage in the Confederacy until June 1, 1861, when they were declared invalid. From then on until October 16, 1861, when the first Confederate general issues appeared, postmasters in the Confederacy had to use whatever means of postage they had available. 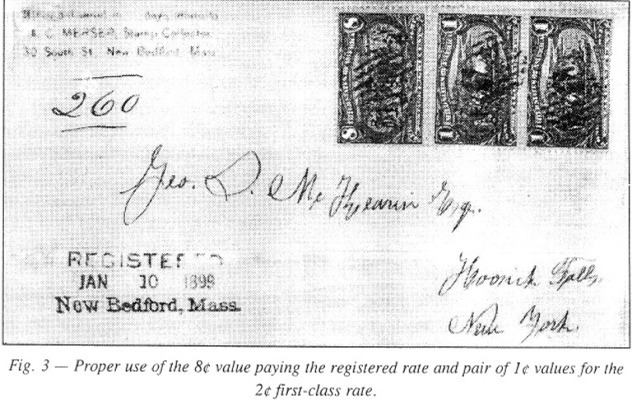 This included handstamp paids, such as "PAID 5," or their own postage stamps (postmaster provisionals). Serge Logan, a resident of Racine, WI, has collected stamps since 1942. Other than U.S. Christmas stamps, he specializes in U.S. stamps in general, Scouts on stamps, and Russia. He has held many offices in the local WFSC member clubs shown above and currently serves as newsletter editor for both groups. Other philatelic memberships include the American Philatelic Society and the Scouts on Stamps Society International. The article that follows is an excerpt from Serge's seminar presentation at STAMPSHOW 97 held in Milwaukee this past August. 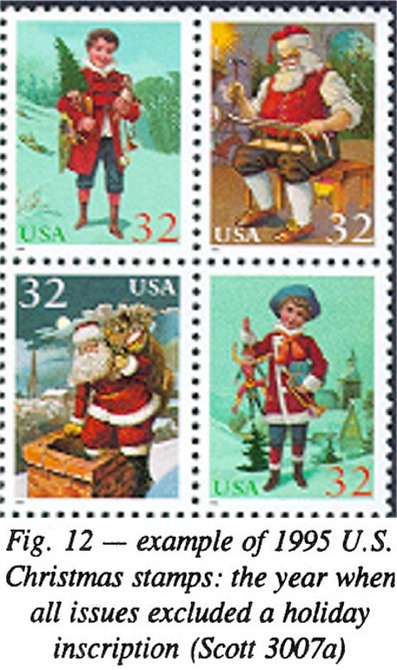 The 34-year-old United States Christmas stamps series began in 1962. The popular series now boasts 101 face-different stamps, with 167 collectible types. By adding all luminescent-tagged types to the basic count, the number rises to 106. Add to that number the precanceled types of 1969 and 1970, and the total climbs to 181 collectible stamps - singles only! The program began amid a shroud of controversy. Even though the initial offerings had no religious connotations, the idea was perceived by many to be one step too far in eliminating the separation of church and state. 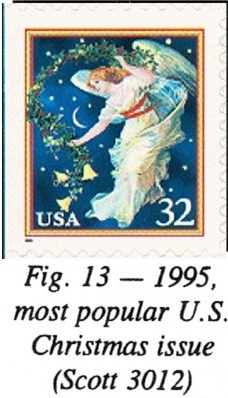 From the very first U.S. Christmas stamp, a large number of these issues have set major and minor marks in philatelic history - they are truly a group of innovators. Because of space limitations, only some of those innovations are cited here. 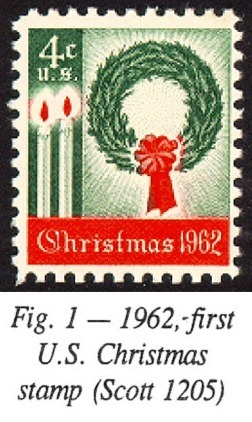 The first issue depicting the traditional wreath and candles (Figure 1) was notable not only for being the first U.S. Christmas stamp, but also for a more technical reason. The first printing was 500 million, or three times the normal quantity for a stamp in those days. Demand for the new issue, however, exceeded supply, so 360 million more were printed. The problem was a lack of enough paper of the proper size to be able to reproduce the stamps in panes of 100. The result was that about 50 million stamps were produced on smaller size paper in panes of 90 without plate numbers. Thus, this issue became the first to have missing plate numbers since the Bureau of Engraving and Printing began production in 1894. The 1963 stamp depicts the national Christmas tree at the White House. This stamp was the first to have luminescent tagging. Of the one billion stamps printed, only about 11 million were tagged. 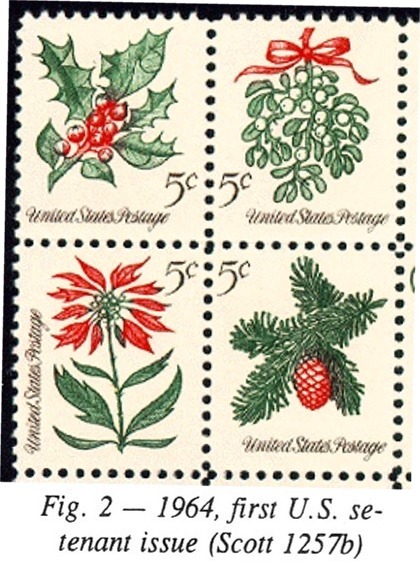 Four vertical definitive-size stamps portraying holly, mistletoe, poinsettia, and a sprig of conifer, were issued in 1964 (Figure 2). This foursome was an important innovation - the first time a se-tenant block was produced in the United States. 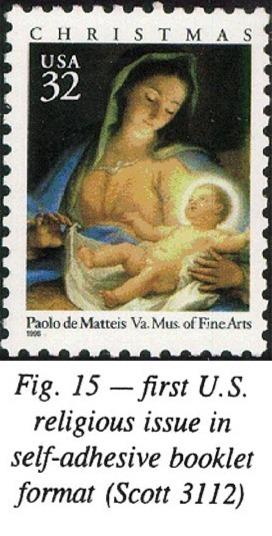 The 1966 issue represents the first time a religious masterpiece was depicted on a U.S. stamp - an innovation to be continued through the years (Figure 3). The seventh annual issue was based on "The Annunciation," by van Eyck. It was the first U.S. stamp produced on the nine-color Huck press, an important printing innovation for the BEP. Stamps produced on this press had only one selvage edge. And instead of plate numbers being in the corner of the panes, they are spread out over the length of the selvage (Figure 4). As a result, there could be as many as 7,000 combinations, which means 14,000 collectible strips of 10! The horizontal design used for 1969 is based on the painting "Winter Sunday in Maine" (Figure 5). The Post Office Department ordered an experiment aimed at speeding holiday mail and reducing costs at four test cities. Consequently, 30,440 stamps were precanceled with the idea that this mail would bypass the canceling machines, thereby saving time and money. In Atlanta and New Haven (two of the four test cities), the precancel overprint was in green as well as in black, and New Haven overprints were in both a light and dark green! 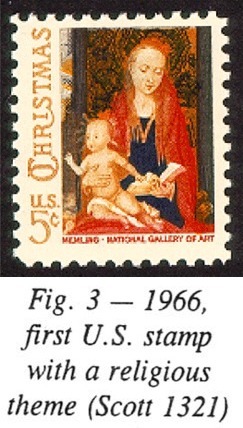 The year 1970 was the first year the public could choose between a traditional or a contemporary Christmas stamp: Lorenzo Lotto's Nativity or 19th century Christmas Toys. The Christmas Toys issue was an innovation in that it was the first commemorative-size se-tenant block of four, with precanceled versions over-printed with two wavy lines furnished to 69 major cities and all of New England (Figure 6). Few people knew the difference, as the precancellines could conceivably be part of the drawing. In addition, the U.S. 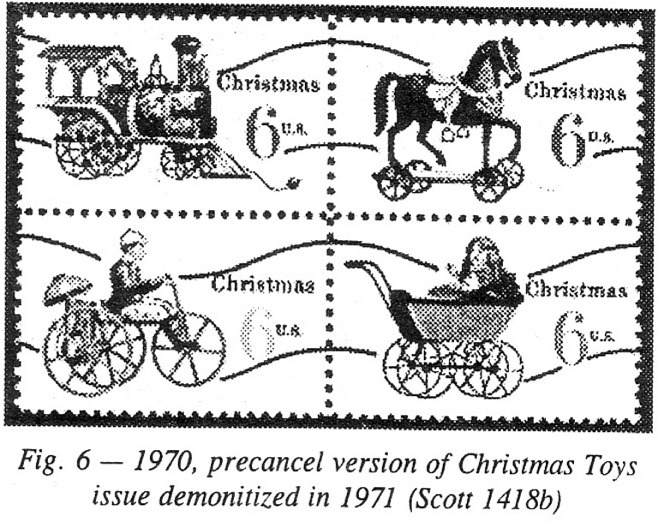 Postal Service announced that the precanceled Christmas stamps would be valid for postage only through January 31, 1971. This was the first time since the Civil War that a U. S. postage stamp was declared demonetized or invalidated! The needlepoint Christmas tree featured on the 1973 issue was an actual creation by designer Dolli Tingle. This is the first and only U.S. stamp that has been rendered in this manner (Figure 7). 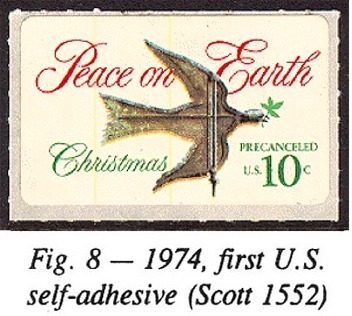 While two of the 1974 issues followed the normal pattern, a third stamp (unique in U.S. postage) was the first pressure-sensitive adhesive. It depicts a weather vane atop Mount Vernon (Figure 8). For collectors, this stamp was a disaster. Because it was printed on uncoated paper, the adhesive eventually soaked into the stamp, destroying it. In 1975, the first two U.S. stamps were printed without a denomination (Figure 9). At the time the stamps were printed, there was a possibility of a postal increase from 10c to 13c. 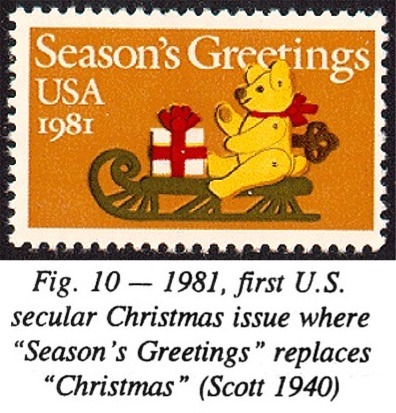 The 1981 religious stamp featuring "Virgin with Child," by Botticelli, was in definitive size, while the secular Teddy Bear on Sleigh issue was a commemorative size. For the first time, the secular stamp appears without any mention of "Christmas. " Instead, "Season's Greetings" is used for the inscription (Figure 10). This would become the standard for most future dual issues. In 1992, we saw the reintroduction of the self-adhesive stamp, this time on coated paper to prevent the adhesive from leaking through to the face of the stamp. The stamp duplicates the train from the secular four-some depicting antique toys. Another innovation cropped up for a holiday issue of 1993. 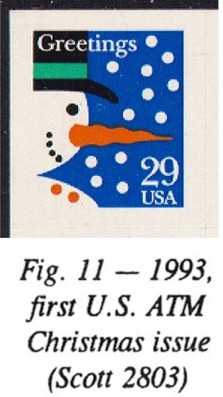 The USPS took the snowman design from the secular se-tenant issue and reproduced it on self-adhesive panes of 18. Since the panes of 18 were specially made for ATM machines, they were available only from the Postal Service's philatelic centers (Figure 11). In all, we had 25 collectible stamps in 1995, and not one of them included the words "Christmas," "Season's Greetings" or even "Greetings" - only "USA" and the frank (Figure 12). 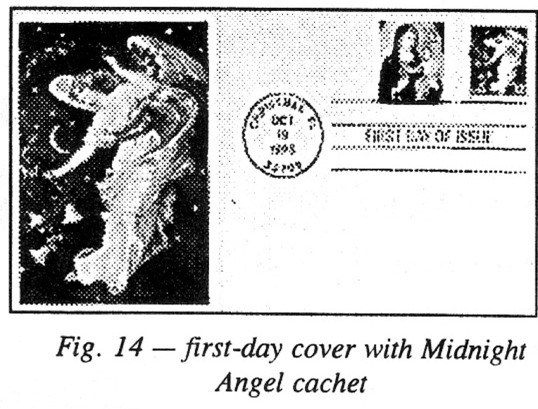 This was also the year of the Midnight Angel, a self-adhesive that was perhaps the most popular Christmas stamp ever issued (Figures 13 and 14). 1996 was yet another bonanza year. A se-tenant foursome depicting family holiday activities, self-adhesives with the same subject, a single ATM self-adhesive depicting skaters, the reissue of the Midnight Angel self-adhesive pane and coil, Madonna and Child in sheet format and, for the first time for the religious issue, a self-adhesive booklet (Figure 15). Also for the first time, the contemporary and religious Christmas stamps were not issued on the same date. Instead, the contemporary first day was on October 8, while the religious issue didn't come out until November 1. Almost 3.5 billion 1996 holiday stamps were produced. This year, along with the usual Christmas issues, the Hanukkah stamp of 1996 was reprinted and a stamp observing the African-American holiday, Kwanzaa, was added. The Postal Service now calls all these items "Holiday Celebration" issues. Whether or not you approve of holiday issues, as a stamp collector you have to accept the place they occupy in history. As mint or used singles, nobody wants them, but they are legitimate and collectible postal emissions.